Traditional cookies are a must for many people during the Christmas season. Everyone has their own way to fill in that blank. For some, it's not Christmas without watching "It's a Wonderful Life." For others, the holiday just isn't complete without an eggnog-fueled rant from Cousin Sal. I say, it just wouldn't be Christmas without cookies. Scientists say there's a Teflon bond between the sense of smell and memory. For me, Christmas brings to mind my grandmother's cookies. She made three types at Christmas: coconut date balls, intense and, well, coconutty; Hungarian cookies, rich with butter and powdered sugar; and (my favorites at the time), toasty, sweet, homemade Rice Krispies Treats. She would store the cookies in round tins that were sealed tight. When they were opened, the ambrosial scents would fill the air and zing! Instant smell memories were created. Now, whenever I see a Christmas tree or lights or stockings, a little part of my brain blips to the memory of Big Grandma's cookies. My sisters and I eventually took over the cookie-baking duty and started our own tradition. We'd gather early on a Saturday morning and dive into our box of recipes. We continued making grandma's cookies, but we also experimented with lots of other recipes as well. We've kept a journal through the years of our successes and, more often than we'd like to admit, our failures. There were the Kit Kat Bars that were renamed Squirrel Cookies. A tray of chocolate-topped bar cookies was set outside to cool. Unfortunately, a couple of squirrels found them and had a pre-holiday feast. Then there were crescent cookies that unfolded in the oven and hence became square cookies, and the peppermint cookies with the simple notation: "They came out like crap." There's one Christmas cookie, though, that shows up on every dessert tray, one that says Christmas has officially arrived. That cookie is the cutout sugar cookie. Due to the popularity and ease of pre-made refrigerated cookie dough, the sugar cookie has gotten a bad rap. Not only do those pre-fab cookies taste artificial, they also don't hold their shape well. Gingerbread men come out looking more like gingerbread blobs. Never mind the fact that there are usually sexier cookies, like pistachio biscotti and peanut butter blossoms that steal the limelight. But when they're done right (that is, made from scratch with simple ingredients), the humble sugar cookie can be the star of the show. Several years ago, I stumbled upon the perfect cutout sugar cookie recipe. The ratios of butter, sugar and flour are just right to yield a cookie that is soft and chewy but holds its shape beautifully. Once I discovered this fool-proof recipe, my cookie cutter collection began to grow. For those looking to start (or add to) your cutter collection, Fairfield's Kitchen Corner is the place to go. "We have over 300 different cookie cutters," said owner Jack Ciarletto. For Christmas, you can choose from snowflakes, Christmas trees, reindeer, snowmen, mittens, Santa, ornaments, gingerbread men and women, candy canes, angels and more. And the cutters are just the beginning. After that, they have a huge array of decorations, from sanding sugar and jimmies to food colorings and edible pearls. All the choices can be a bit overwhelming, so they also offer kits to make gingerbread houses, gingerbread trees and gingerbread men. "We've been here for over 30 years," said Ciarletto. "Cookie cutters are always popular at Christmas time." If, however, you need a little more guidance in the baking department, consider taking a class at Westport's CakeSuite. This Saturday and next (Dec. 15 and 22), owner Michelle Ashear Klem will lead a two-hour class for all levels and ages. During the first part of the class, students will bake a variety of cookies, and the remainder of the time will be spent decorating. 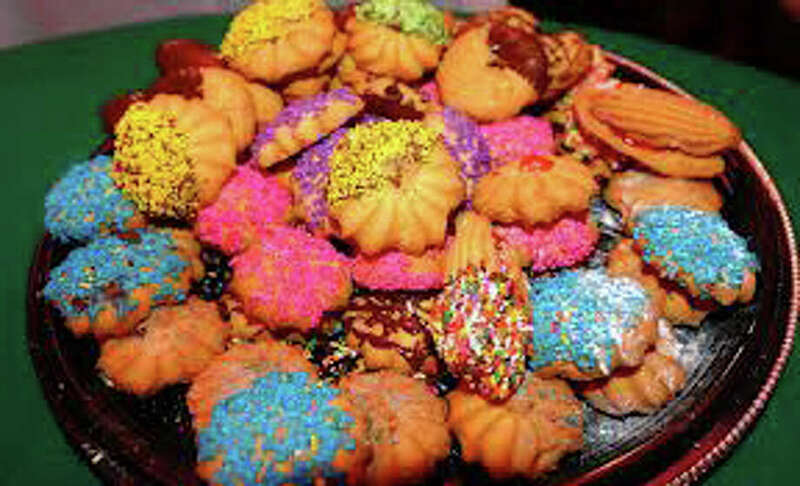 At the end, everyone goes home with an assortment of homemade, hand-decorated cookies. This Christmas, my sisters and I will be separated by many miles, so our marathon cookie bake will have to be split among three separate kitchens. One thing's for sure, though: we'll all be making sugar cutouts, and none of us will be baking squirrel cookies. Patti Woods is a freelance writer. Contact her at eatdrinkshopcook@gmail.com. In a mixer, cream together butter, sugar, eggs and vanilla. In a separate bowl, mix together flour, baking powder, baking soda and salt. Gradually add to butter mixture until combined. On a piece of plastic wrap, flatten dough into a disc shape and refrigerate at least two hours.